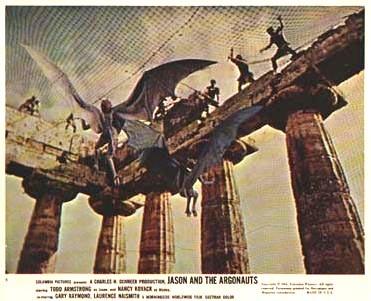 On location: JASON AND THE ARGONAUTS (1963) The Temple of the Harpies! Why build a set when you can use the real thing? In 2006 we visited Sorrento, near Naples in Southern Italy. We stared into the mouth of Vesuvius and visited the well-preserved city of Pompeii. In 79 A.D. volcanic ash buried the city in a cataclysmic eruption. Walking around the streets and buildings, the preserved shells of fallen bodies brought home the scale of the ancient tragedy as if it were yesterday. While visiting the ruined city of Paestum on another excursion, I got the feeling it had been used as a filming location in Ray Harryhausen's Jason and the Argonauts. In the scene where Phileas (Patrick Troughton) is tormented by two harpies sent by Zeus. 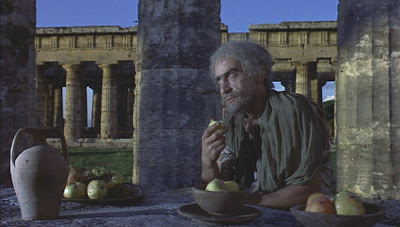 Jason and his Argonauts arrive to talk to Phileas, who will only help if they stop the harpies from stealing his food. I'd not expected to run into this movie location and hadn't prepared at all - normally I'd watch the film beforehand for clues. Because the scene was vague in my memory and I was only working on a hunch, I only got the details right after the visit. On the day, I decided on completely the wrong temple! The information at the site didn't mention anything about it. 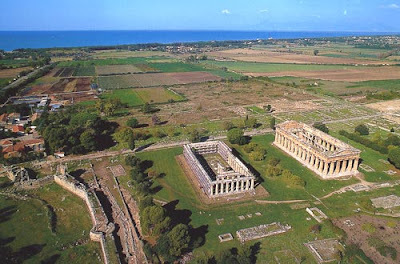 Paestum used to be a Greek settlement, named after the god of the sea, Poseidon. Incredibly the layout of the city is still easy to seen, as well as many remaining structures (like a small colliseum) and three well-preserved temples that are still standing. Some of the best examples anywhere, even in Greece. The original architects had even built in various earthquake-defying features, enabling a film crew to run around on top of it 2,500 years later! Out of the three temples at Paestum, the one on a slight hill - the solitary Temple of Athena (or Ceres) - looked possible, but I'd guessed wrong. Note that it only has six end columns. 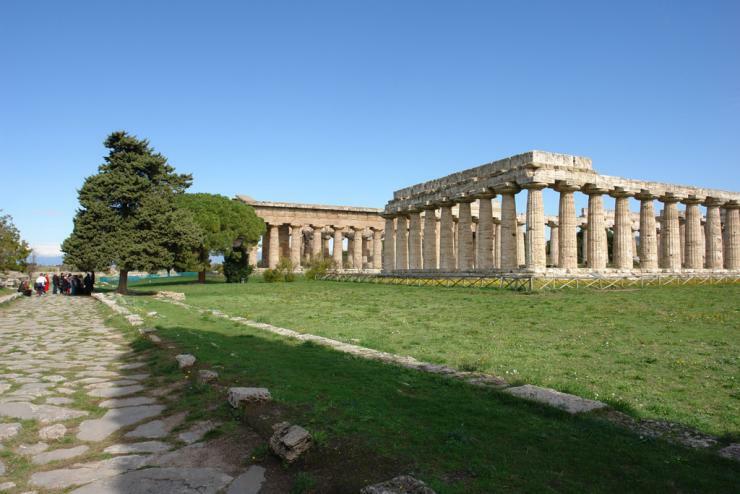 At the other end of this World Heritage Site, furthest from the site entrance, are two temples standing side by side - the Temple of Poseidon (or Neptune) and the Temple of Hera (also called The Basilica). These two shots (above) show the front of the temple from the west, before and after they erected a fence that keeps the visitors out. Also visible in the background of some shots are mountains, which indicates that the west end of the temple was used for filming. 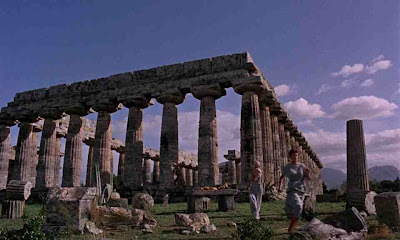 While it's not actually on the coast (the scene of Jason's arrival was faked with a trick of editing), in terms of realism, Jason and his men still arrive at the temple from the direction of the coast. This overhead shot shows the Temple of Hera (on the left) with the sea in the distance. In 550 BC, the coast would have been closer. 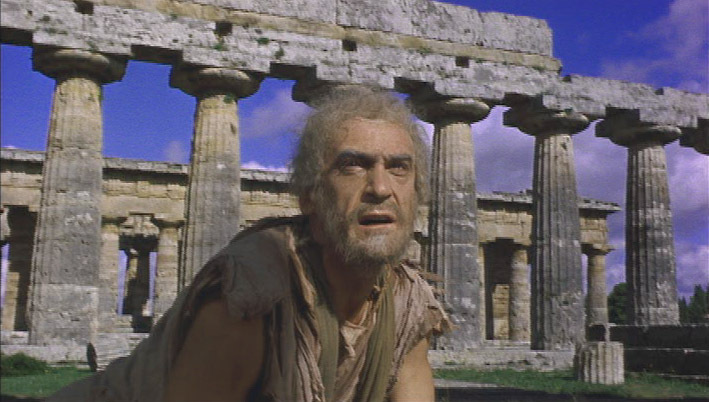 This location is also used earlier in Jason and the Argonauts. 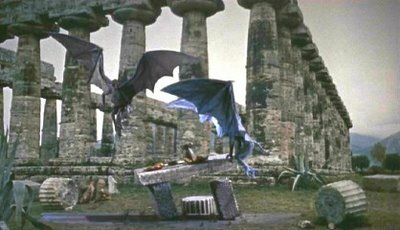 Harryhausen recreated the interior of Poseidon's temple for the opening scene where Jason's mother is murdered. In the film it’s a set, but the original building where those events took place were in that temple next door! The wide flat tops of the columns match the close-ups in the film. Some of the filming took place inside the temple. 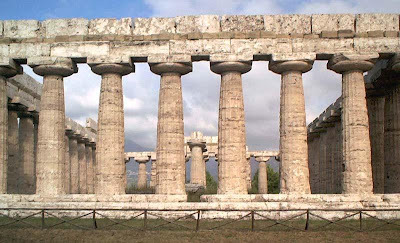 Note the remaining columns inside the structure - they're also visible in this modern view (below) looking inside the temple from the front, towards the mountains. 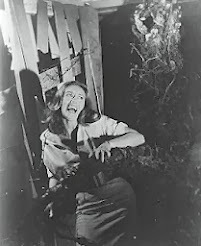 It’s hard for me to precisely explain the fun of visiting old movie locations. But they're the only physic remnants that remain of many movies. 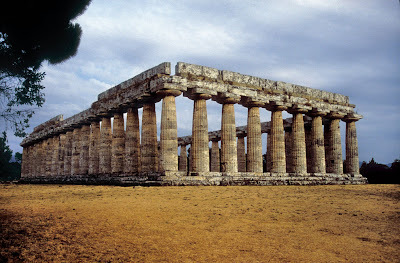 We'd visited Paestum to see ancient temples, which was exciting enough. But it turned out we'd also seen an actual ‘set’ from Jason and the Argonauts, which is very exciting. Especially since it looks much the same as it did in 1963. In contrast, some of the locations for the legendary skeleton fight, like the cliff where Jason jumps, are now underneath multi-storey hotels. 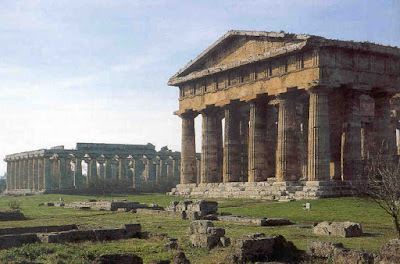 A good site for more views of Paestum here, at Sacred Destinations). Thank you for these wonderful images; may 'The Gods' give you all you ever wanted!! Thank you for posting these wonderful images; and may The Gods give you everything you ever wanted!! It was a lucky find! Thought it had been shot in Spain! Thank you!! Great pix!! Better than IMDB as I watch Jason and the Argos ...!!!! 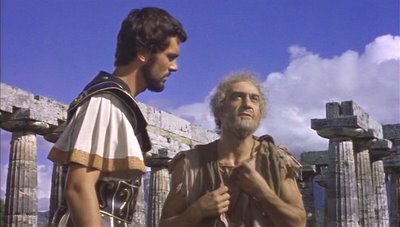 any idea where the scene with hermes and jason in a small oval temple ruins is? or was that a set? Also where did they film talos and the other giant statues? 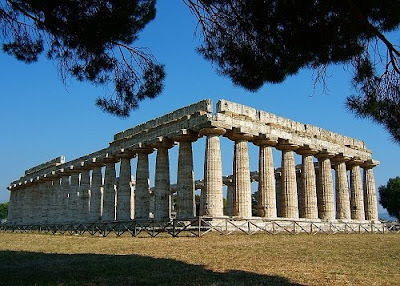 I visited Paestum last week and spent ages trying to decide which was the temple use in the film. Thank you, you have done the research for me. 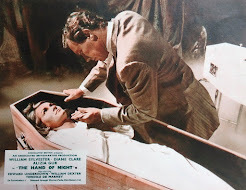 A great film - remembered from my childhood. 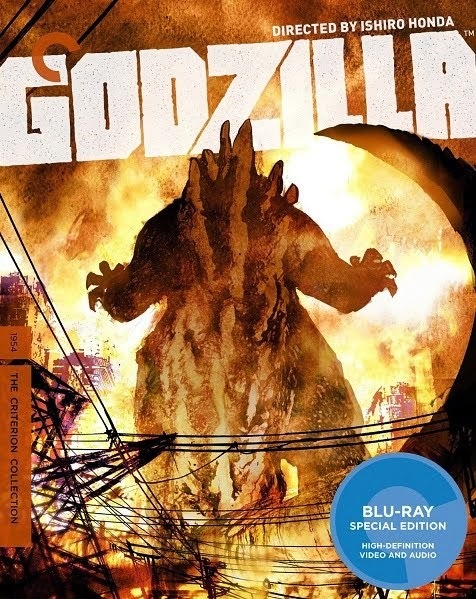 I still love it - a classic. When I was there, I picked the wrong temple and had my photo taken with it!